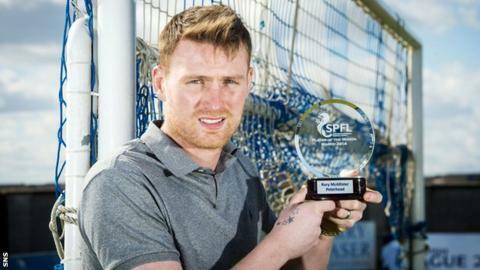 Rory McAllister has become the first non-Premiership player this season to be named Scottish Professional Football League player of the month. The 26-year-old secured the award for March after scoring eight goals in six league games for League Two leaders Peterhead. Hamilton player-boss Alex Neil won the Championship manager of the month. Accies are level on points with Dundee but are top of the table on goals scored. The New Douglas Park outfit drew 1-1 at home with the Dens Park side in a crucial match at the weekend. Celtic's Liam Henderson was named SPFL young player of the month, while his manager, Neil Lennon, received the Premiership award for March.